This article contains fast, interesting, fun facts about Mekal for research, schools, students and kids providing an insight into the lives and religious beliefs of the ancient Egyptians. 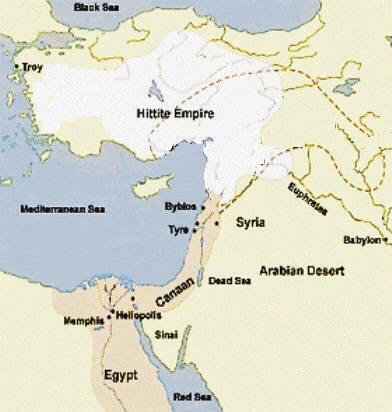 Mekal was the lion goddess of pestilence worshipped in the city of Beit She'an in Canaan, part of the ancient Egyptian Empire (see map below). Her title was the "Fierce Devourer". The ancient Egyptian Empire reached its peak during the 19th Dynasty of the period in history referred to as the New Kingdom. Pharaoh Thutmose III, one of the greatest pharaohs, was famous for his aggressive military campaigns that included the conquest of Canaan. This fierce lion goddess was worshipped primarily in the city of Beit She'an which became a military garrison and the center of the Egyptian administration of the region. 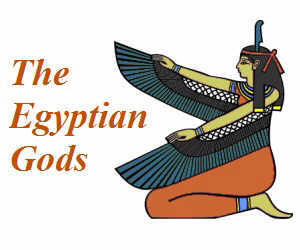 The ancient Egyptians adopted a policy of assimilating some of the important foreign deities, like Ba'al and Mekal, as they were cautious not to offend gods worshipped by other nations. This practice is called 'syncretism' which means the fusion of gods, religious practices and beliefs and their integration into their existing system. Pharaoh Thutmose III (r.1479–1424 BC) initiated the construction of a new temple dedicated to the lion goddess adopted from Canaanite religion at the same time the garrison and administrative buildings were built at Beit She'an. The enemies of the 'land people' of the Egyptian Empire were the 'sea peoples' who included seafaring raiders of the Hittite Empire. Pharaoh Merenptah (r.1213 BC - 1203 BC) of the 19th dynasty continued to fight against the Hittites. The Hittite 'sea peoples' were described in the speech of Merneptah inscribed in a stele at Karnak, before the Battle of Perire. "...They come to the land of Egypt to seek the necessities of their mouths ... Their chief is like a dog, a man of boasting without courage..."
The Lion and Dog stele (see above picture) was discovered near the site of the Temple of Mekal. 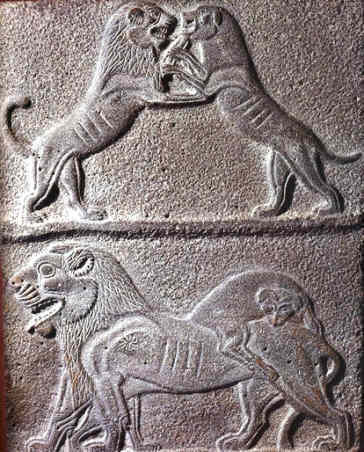 The stone engraving depicts the the dog and the lion in battle followed by a depiction of the triumphant lion. We believe this to be a possible symbolic representation of Egypt vanquishing its Hittite enemies. The lion goddess was therefore revered as a fierce protector goddess and like other lion gods was strongly connected to the sun. The sun gods brought life, health and prosperity but could also be a destructive force bringing drought and pestilence. Mekal is therefore given the title of the goddess of pestilence. Inscriptions praising the deified god Imhotep were placed on the walls of many Egyptian temples. A stone stele was found outside the temple of Mekal depicting figures standing opposite the lion god and an inscription stating that it was dedicated by the Egyptian scribe to the memory of his father. Facts and information about Mekal for kids with some amazing, cool and quick information about ancient Egypt and Egyptians. These fast interesting facts about Mekal are ideal for children, homework, schools, teachers and kids of all ages.